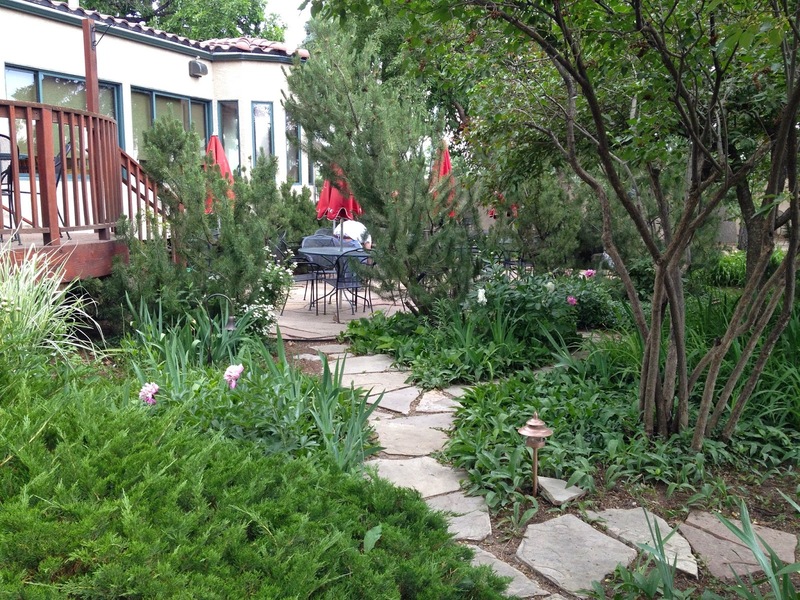 The garden patio at the back of the Lambspun shop in Fort Collins. was during most of February and now into March. Our mountains and ski resorts got lots of snow which is great for them, but along the Front Range of the Rockies (where Denver and Fort Collins both are located) our weather stayed warmer and milder. We had a nice snow early in February and that's the last we've seen here in Fort Collins. Believe it or not, we actually could use some rain or snow because it would bring much needed moisture. I've already run the garden hose on several of my rose bushes and large plants like the Peony. And, I've sneezed a few times, which confirms that Spring Stuff is floating in the air. :) I don't have big problems with allergies which I can counteract with the little over-the-counter pink pills, so I'm not complaining. I've had scores of friends who have BIG problems with all sorts of allergies, so their lives are seriously affected. I get to spend most afternoons sitting outside with my laptop writing away. Crabapple tree in Vienna, Virginia last spring. Of course, a brief cold front could (and often will) blow across the mountains and drop some light snow in the last of March and during April. Not a problem. With our bright Colorado sunshine every day, those spring snows literally melt away in a day. What's your weather like now? Still cold and filled with snow? Or, are you seeing hints of an early Spring, too. P.S We still have plenty in Southern New England and you are still welcome to it. In Ct as Gram said, we still have lots of snow on the ground. It is melting, but slowly. Yesterday the wind was bad and it was lucky to make it out of the 20's. My sneezing started a few weeks ago and then I read the sap was running in the maple trees. I always start sneezing and then see that they are tapping the trees. I don't know why that happens to me but that is the way it is. Yes, I am allergic to maple trees but the sap doesn't fly around, so I don't know why I sneeze at that time of the year. awful here. at this moment -9C feeling like -15C. (18/10F). Love the photos! Here in New Jersey we're cold (about 30 degrees F), but it should warm up tomorrow and it's supposed to rain. Good for all the little buds just waiting to pop out! Oh my goodness, Diane---I don't know what I'd do if I was allergic to maple trees. I've had them around me my entire life---growing up in Northern VA, living 15 years in West Lafayette, Indiana (Purdue Univ), and here in Northern Colorado. And it sounds like you are definitely allergic to that sap. Clearly, one of the natural substances in the sap must float on the air so you can inhale. I doubt you'd sneak over and take a taste as it's running. emilia.m --- Where do you live? One year when we had snow after there were leaves on the trees, I went out to shake a young maple tree to get the snow off. By the time I got into the house I thought I had a bad cold all of a sudden, until it dawned on me that the pollen had fallen on my face and I must have inhaled some of it. Was on meds for a week. I thought it was strange how fast the cold came on. Now I know to not ever do that again. Once it's Summer I'm ok. I know that's disappointing since it's Spring Break week, but a good rain like that will set you up perfectly for the beginning of Spring. Just put on your rain jacket with hood and go back in the yard and get to work. You know how lucky we are in the West. We regularly get these light rains, not drenching like in the Midwest or Back East.